We are constantly asked if we recommend the purchase of pet insurance for our Frenchies, and, if so, which company we would recommend. Because we have been asked these questions so often, we decided it was time for us to do some research and learn more about the insurance market, the pros and cons of purchasing pet insurance, and which pet insurance company or companies are highest rated. So, for the first question: do we recommend pet insurance for our Frenchies? The answer is that it really depends on each client – your tolerance for risk, the lengths to which you would go to preserve the life of your beloved companion, and your financial situation. Of course, our guarantee covers death or significant disability due to a genetic or congenital defect prorated for 10 years, but what about accidents, diseases, or illnesses which can and do occur unexpectedly in the lives of even the healthiest Frenchies or problems that arise after the guarantee period? Sometimes, no amount of money can preserve the life of a beloved pet (especially a high quality of life) which has suffered from one of the problems mentioned above. However, often, with the right medical intervention, high quality lives can be preserved, and it is always a shame if the high cost of treatment and medical care prohibit this from happening. Even fixing a broken bone can cost several thousand dollars, and the cost to treat many other conditions can become exorbitant. If you are independently wealthy, you can probably afford to self-insure and not worry about the potential high cost to preserve the life of your 4-legged family member in the event the worst scenario occurs. However, if you are like most of us and a high 4 or even 5 figure vet bill is something your budget cannot not handle, insurance might be worth considering. A fairly small monthly premium can provide a lot of peace of mind, and, if the worst does happen, the life of your beloved companion(s) can potentially be saved &/or enhanced. Now, for the second question: what company would we recommend? After doing a lot of research and investigation, the pet insurance company that is constantly rated highest by policy holders is Healthy Paws. This company has consistently achieved a 98% customer satisfaction rating which is exceptional for this type of product and company. There are some other companies which also rate fairly highly, but Healthy Paws is clearly the leader in the field. 3) With their “Every Quote Gives Hope” program, every pet insurance quote helps a homeless pet! 4) No more claims forms! Just use their Mobile App or online Customer Center to submit claims. 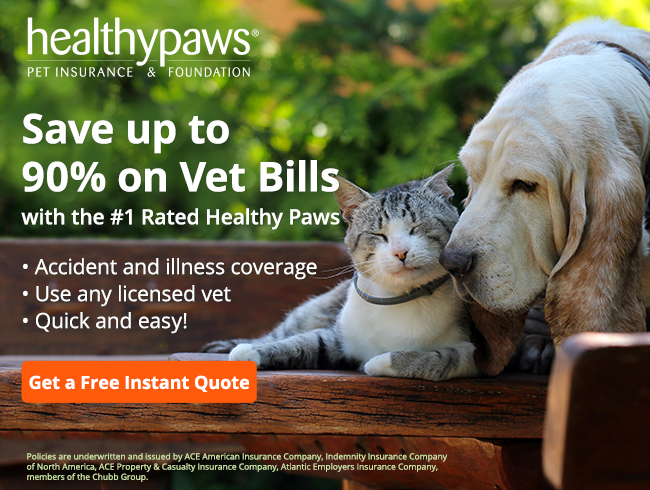 As a participant in our Healthy Paws Partner Program, you will receive a SPECIAL LIFETIME DISCOUNT off the underwritten premium (varies by state)! Click below for more info!